On this Monday morning, the atmosphere in Chikwawa District was foggy and raining heavily, deterring many from accessing their workplaces. But at Illovo Trading Centre, Glory Nthawi, a Standard One teacher at Mazongoza Primary School, was preparing for a 21-kilometre (km) journey to work. There are no buses or vehicles to ferry people from her area to the school. Motorcycle taxis (Kabaza) are available, but Nthawi says they are expensive and unreliable this rainy season. She says it costs K1 500 and she would need K3 000 a day. With her face gleaming that she would make it to school, she jumps out of her rented apartment and look up as if to beg the blue sky. She unfolds her umbrella and with her right hand pushes her bicycle in front to start off. Every day, the 34-year-old cycles 42km to and from work. Her class has 105 pupils. She laments that the class size and distance to school are some of the factors haunting her career life. However, Nthawi says she has no plans to leave the school. She has turned down tempting offers. In 2017 she turned down an opportunity to pursue nursing at Ekwendeni College of Nursing. She has grown up wanting to be a nurse. With a population of 720 pupils, the school sits on an island surrounded by the Shire River. Before the 2015 floods, it was a single river, but it branched into two semicircles forming an island that hosts the school. 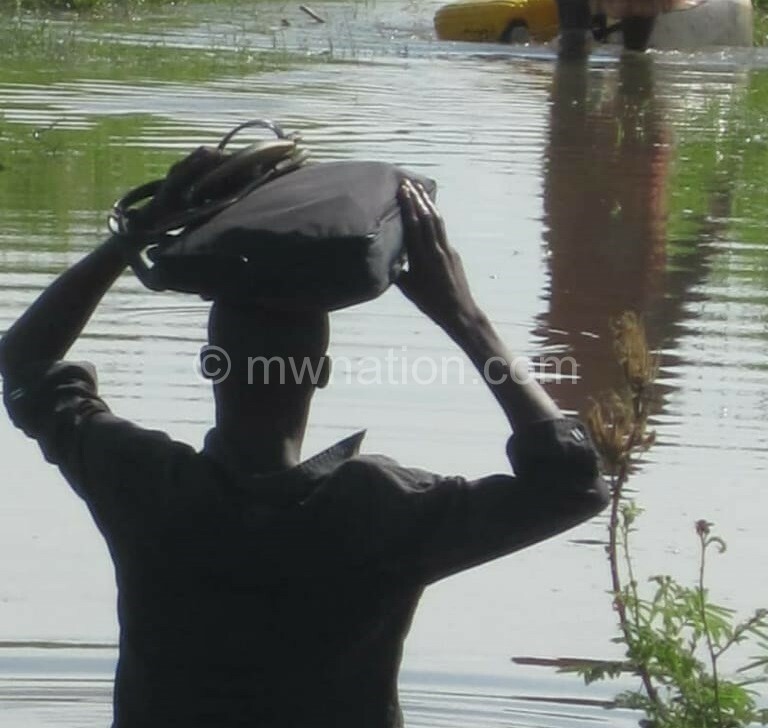 Entrepreneurs are now operating boats to help people access the school, but teachers are exempted from paying. However, Nthawi has a bad experience with boats. Nthawi joined the school in 2016 from Chimbiya Primary School after six years of service. She used to travel 5km to work. She volunteered to join Mazongoza Primary School. She is among female teachers who operate under the banner ‘Female Teachers Role Models’. They visit schools in rural areas to inspire girls. “I was shocked to learn that since 2000, the year it was founded, the school has never had a female teacher and many girls drop out of school for no genuine reason. I wanted to change this,” explains Nthawi. Mazongoza Primary School has six qualified teachers. There are two teacher houses, but one was turned into an office. There is no borehole and both staff and pupils drink from the Shire River. Five teachers, including the headteacher John Evance Chiwaya, operate from Illovo Trading Centre. Nthawi is the only female. “There are no houses for rent because the school is surrounded by wetlands. People construct temporary shelters which they dessert during rainy season,” she explains. Chiwaya says all teachers at the school volunteered to be there. “It’s just passion, otherwise, with all things being equal, no one would want to be here,” he says. The five teachers use personal bicycles. She could not afford a bicycle with her skimpy salary, so she obtained a K70 000 loan from Sacco to buy. Cycling to school seems to be practical during the dry season. The heavy rains that have been falling the past weeks have left her scratching her bare head. The flat topography leading to the school is flooded to hip-level. With hardships, she pedals through the deepening waters, but as she tries hard, the slippery surface sends her down. When it is dry, she leaves home at 5am and arrives at work around 7am, but since the rains started she is always late and sometimes stays home. 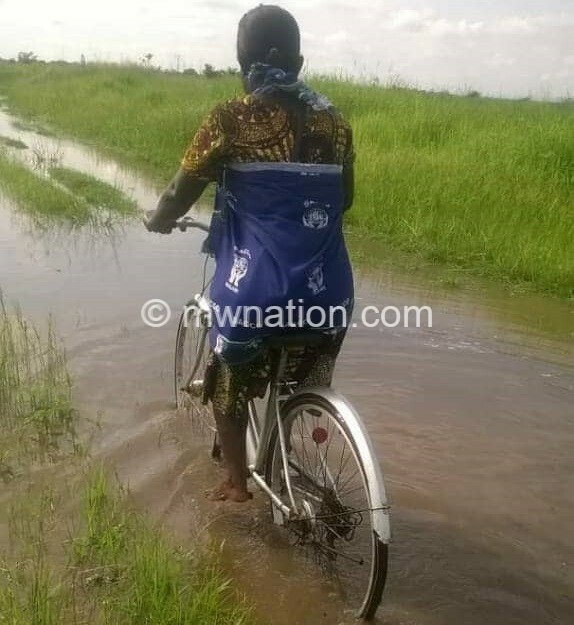 “Instead of riding, I spend more time on the road pushing my bicycle through waters,” she reveals. Despite such a sacrifice, the five teachers get K10 000 as hardship allowance like any other teacher in rural areas. “I came here to inspire the girls to stay in school. I’m happy that I have contributed to the removal of four girls from early marriages and send them back to school,” says Nthawi. Chiwaya says the situation is dire. Last week, he was the only one who managed to go to work. Failing to learn because there are no teachers is a violation of Sustainable Development Goal (SDG) 4, which urges governments to ensure inclusive and equitable quality education for all and promote lifelong learning opportunities. Sadly, pupils from such schools are expected to perform in national examinations like their colleagues in schools not facing such challenges during national examinations. Their teachers, too, have no room for excuses. No wonder, inequality gap in performance continues to widen with the schools in rural areas being the most affected. The situation in Chikwawa suffocates the core theme of the SDGs—no one should be left behind. Goals number 3, 4, 5, 6 and 8 are now trampled upon by government’s negligence to address these basic issues. But the story in Chikwawa cuts across. There is a serious shortage of teacher houses. For instance, in Nkhata Bay, only 536 of the 1 500 primary and secondary school teachers live in school houses that also require major repairs. Chikwawa district education manager Chrissie Chimsale signalled ignorance of the challenges teachers in her area are facing. However, she admitted that the housing issue is dire. “The recommended ratio of housing is 1:1, but this is not the case on the ground. Now, we don’t have a project for new teacher houses,” she says. Chimsale says the only time she got reports of teachers failing to access their schools was in 2015 after the historic floods. Civil Society Coalition Education (Csec) executive director Benedicto Kondowe is not surprised. He says government has failed completely in the provision of teacher houses since 1994. He blames it on lack of political will and government’s failure to recognise teachers’ role in society. He says education allocation in the national budget is a testimony.